An unaltered photocopy of your DD-214, OR WD AGO 53-55, OR other military issued document clearly displaying your Navy Battle E.
The Navy E, otherwise known as The Battle Efficiency or The Battle Effectiveness award was first created as a patch in 1906. The Navy "E" Ribbon was established in July of 1976 by Secretary of the Navy J. William Middendorf. Patch: In effect from 1906-1974. Ribbon: In effect from July 1, 1974, to the present. Wearers of the patch will convert to the ribbon. The Navy "E" Ribbon denotes permanent duty on ships or in squadrons that won the battle efficiency competition after July 1, 1974. This ribbon replaces the "E" patch previously sewn on the right sleeve of the uniform. Wearers of the patch will convert to the ribbon. The Navy "E" Ribbon is worn after the Meritorious Unit Commendation and before the Prisoner of War Medal. A silver "E" one-eighth of an inch high is authorized for wear on the Navy "E" ribbon for first, second, and third awards. For four or more awards one wreathed "E" is worn centered on the ribbon bar is authorized. 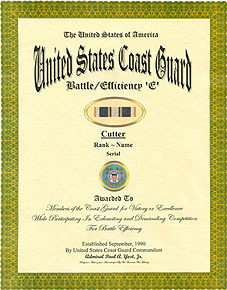 A Secretary of the Navy recommendation in June of 1976 established this award to replace the Battle Efficiency Award (the letter "E") which had been worn sewn to the sleeve of the uniform. It is authorized to be worn by all crew members of ships and aviation squadrons winning the fleet-wide eighteen month competitive cycle which has exercises testing all phases of battle readiness. 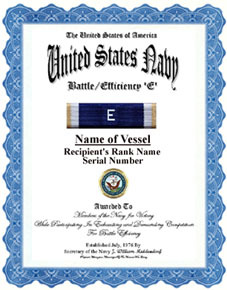 The Battle Efficiency Award, called the Navy Battle "E", in addition to the ribbon, consists of a cloth insignia and a battle pennant to be displayed by the ship or unit winning the award. 1. Criteria: The Navy "E" Ribbon denotes permanent duty on ships or in squadrons that won the battle efficiency competition after July 1, 1974. This ribbon replaces the "E" patch previously sewn on the right sleeve of the uniform. Wearers of the patch will convert to the ribbon. 2. Components: A silver "E" one-eighth of an inch high is authorized for wear on the Navy "E" ribbon for first, second, and third awards. For four or more awards one wreathed "E" is worn centered on the ribbon bar is authorized. 3. 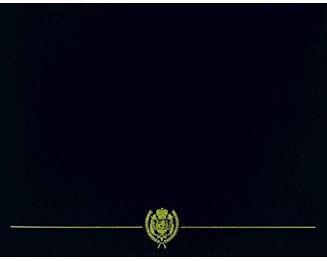 Background: A Secretary of the Navy recommendation in June of 1976 established this award to replace the Battle Efficiency Award (the letter "E") which had been worn sewn to the sleeve of the uniform. It is authorized to be worn by all crew members of ships and aviation squadrons winning the fleet-wide eighteen month competitive cycle which has exercises testing all phases of battle readiness. The Battle Efficiency Award, called the Navy Battle "E", in addition to the ribbon, consists of a cloth insignia and a battle pennant to be displayed by the ship or unit winning the award. The Navy "E" Ribbon was established in July of 1976 by Secretary of the Navy J. William Middendorf. The Navy "E" Ribbon has been in effect from July 1, 1974, to the present. The Navy "E" Ribbon denotes permanent duty on ships or in squadrons that won the battle efficiency competition after July 1, 1974. This ribbon replaces the "E" patch previously sewn on the right sleeve of the uniform. Navy "E". The Navy "E" ribbon is designed with a 3/16 inch silver "E" attachment centered on the ribbon. Members who earn the second and third award add an additional 3/16 inch silver "E" attachment for each award. Place multiple "E" attachments in a symmetrical, horizontal line in the center of the ribbon. For four or more awards, wear only one 3/16 inch silver wreathed "E" attachment centered on the ribbon. 1. Criteria: The Navy "E" Ribbon denotes permanent duty on ships or in squadrons that won the battle efficiency competition after July 1, 1974. This ribbon replaces the "E" patch previously sewn on the right sleeve of the uniform. a. All personnel serving aboard their unit for more than 50 percent of the period during which it undergoes Refresher Training are eligible for the "E" Ribbon. Personnel serving less than 50 percent of the period, or personnel who are on leave or TAD during the evolution are not eligible, unless specifically recommended by the commanding officer. b. Commanding officers/officers-in-charge may authorize the "E" Ribbon to any member of their command who previously served aboard authorized units upon evidence of their assignment during the training period. c. With the exception of the units listed in the List of Eligible Cutters no permanent records of Refresher Training results exist. In order to recognize all ships' crews who have previously met the intent of this policy, individual Commands are encouraged to submit documentation to (G-WPM-1) which will facilitate the addition of those units to the list of eligible cutters. (4) Any other conclusive evidence that shows that a unit achieved an overall operational readiness "E" award during Refresher Training and the requesting individual was assigned to that unit during the designated Refresher Training period. In 1906 President Theodore Roosevelt ordered an "E" to be painted in white on warship gun turrets for those crews that had performed well in the Spanish American War thus establishing the Navy Excellence "E" for gunnery. The "E" was also authorized for wear by the enlisted gun crews earning the award as a round patch with a white "E" worn on the sleeve above the cuff. The placement was moved to the upper right sleeve in the 1950s. A red "E" for excellence in engineering and a green "E" for excellence in aviation were similarly rewarded some years after the excellence in gunnery "E" was established. Around 1938 a horizontal hash mark was added below the "E" for subsequent awards. In 1957 the horizontal hash mark was changed to a diagonal hash mark. In 1960, a gold "E" was authorized to represent the fifth award of the "E" and a gold diagonal hash mark was authorized for each award after the fifth award. At some point the "E" came to denote winning competition in readiness for battle efficiency instead of the original "excellence" in Gunnery award and was referred to as the Battle Efficiency "E" after that point. This occurred after 1947. The Navy "E" Ribbon denotes permanent duty on ships or in squadrons that won the battle efficiency competition after July 1, 1974. This ribbon replaces the "E" patch previously sewn on the right sleeve of enlisted uniforms.